1. Make sure that you are pasting in your license key exactly with the dashes/hyphens in-tact, copy and paste the entire license key in to the prompt and do not attempt to manually type in that license key. 2. Make sure that you are using the appropriate version of the Setup program that matches the license key for the version of NovaBACKUP that you purchased. For older versions of the software please submit a support ticket at http://novabackup.com/ticket requesting a download. 3. 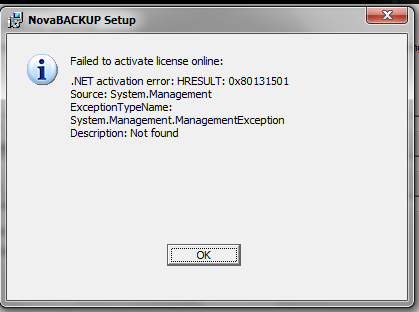 If during the installation of NovaBACKUP software you still get the same ".NET activation error" error as displayed in the example screenshot above, then your installed Microsoft .NET Framework is still not in a stable state to utilize with the activation/registration phase. Perform a repair of the Microsoft .NET Framework on that PC using the repair guide mentioned below. Once the .NET Framework is either repaired or removed and reinstalled, run the NovaBACKUP Setup program once more to see if you can continue past the activation stage. Setup-NB-PC.exe /Log /q /noreboot /ComponentArgs "Backup Client":"/q /prop REBOOT=ReallySuppress /log c:\NBK_NET_activation_Setuplog.txt"
Paste that entire command in directly, starting with "Setup-NB". Make sure to change the first "Setup-NB-PC.exe" part of that command to match the file name of the setup .exe installer that you downloaded so that the above command can work.